The first cassette toilet with china bowl. The ceramic inlay in the plastic unit of the Dometic CTS 3110 is a true innovation for recreational vehicles. It makes your sanitation system easy to clean and scratch-resistant which insures an unsoiled appearance for many years. 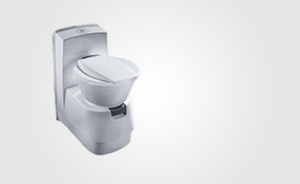 Identical with household toilets in shape, height and material the CTS 3110 offers top comfort. Compared to common products the round seat gains 8 cm of depth in the narrow space of the bathroom. For maximum flexibility the seat can be rotated stepwise up to 90°, making corner installation possible.